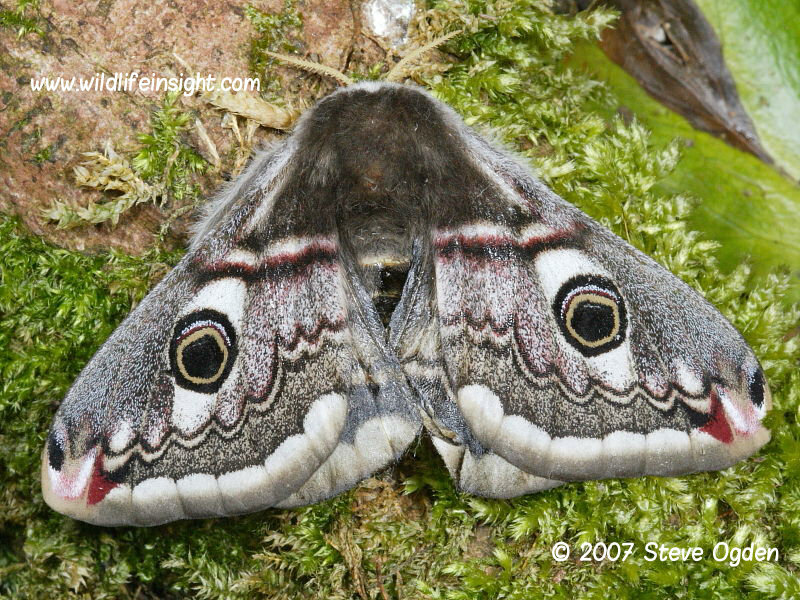 The Emperor moth, Saturnia pavonia, is the only member of the Saturniidae family of moths found in the British Isles. The best known members of this group are the Silk Moths of the Tropics which have been farmed for thousands of years for the silk spun by their caterpillars, commonly referred to as Silkworms. 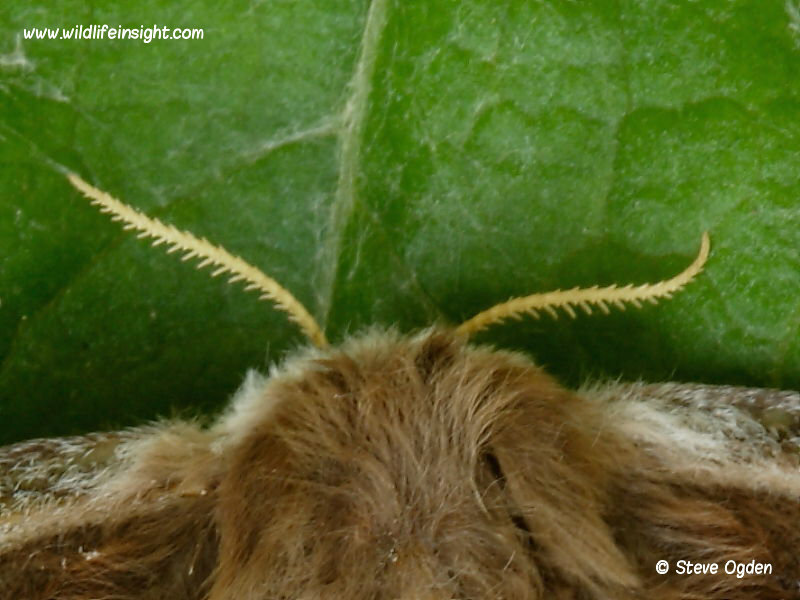 The species of Silk Moths farmed today are not found in the wild and have evolved from the captive breeding of species originally collected from the wild. 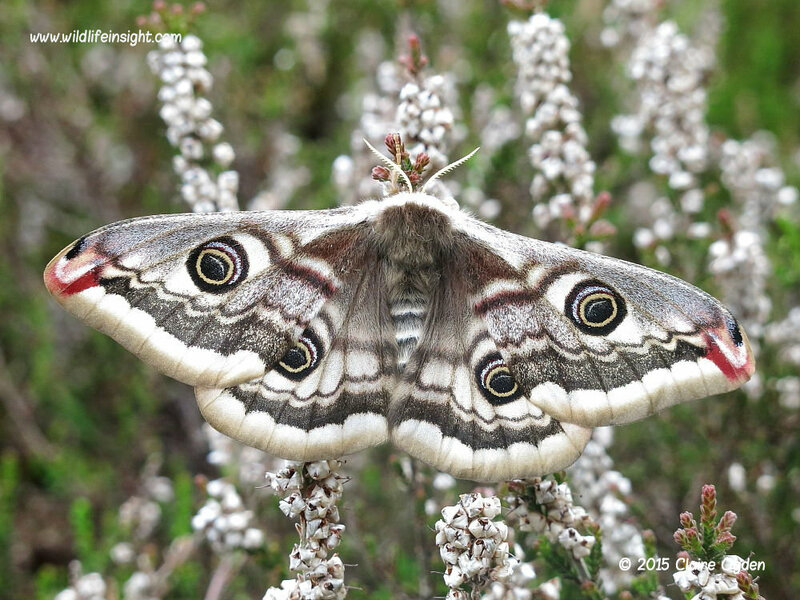 The Emperor moth is found in open countryside across much of the British Isles from the extreme south west of Cornwall to the far north of Scotland. It is particularly common on moorlands and heathland where the caterpillars principal food plant is heather. 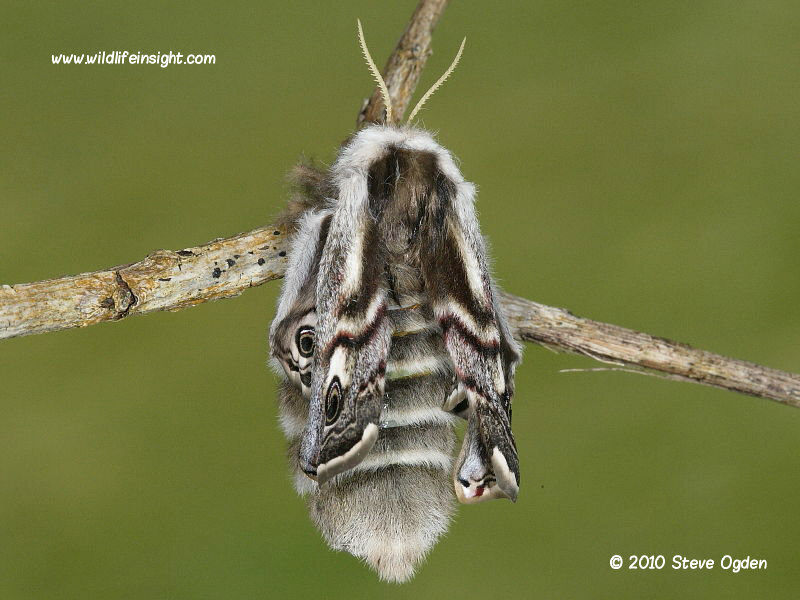 The adult moth flies in a single generation between April and May with the males flying during the day and the females at night. 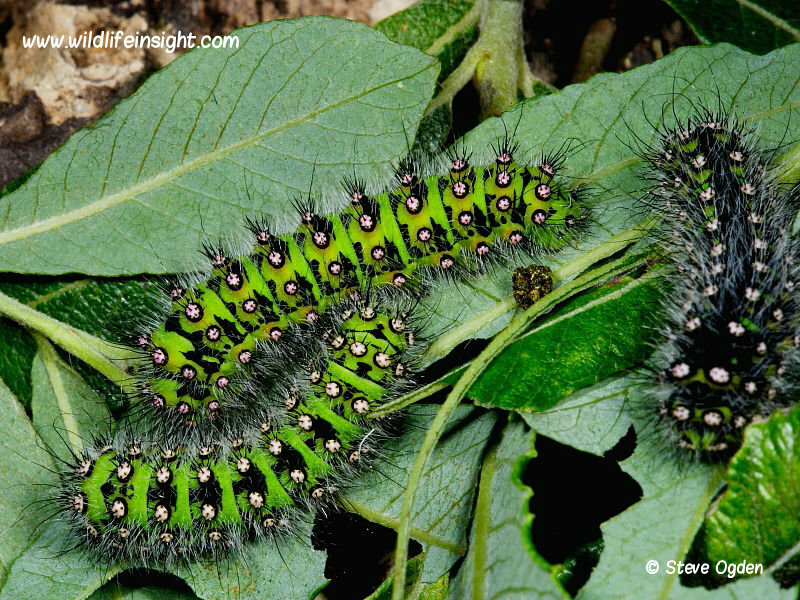 The caterpillars also feed on a variety of other trees and shrubs including Hawthorn, Blackthorn, Hazel, Sallow and Bramble. The view left is of typical Emperor Moth habitat at Eastern Cliff Kennack Sands on the Lizard Peninsular, Cornwall. 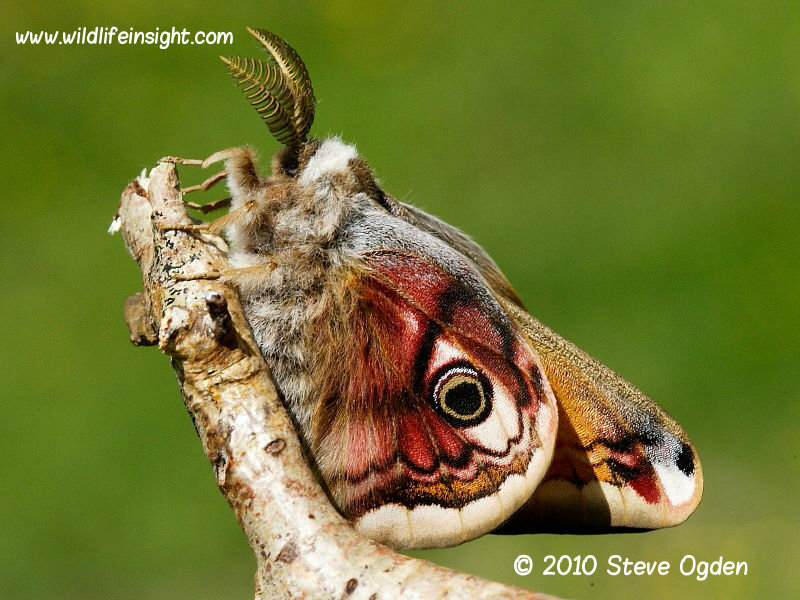 The male Emperor Moth is smaller than the female with a wingspan of about 65mm. Both the orange hindwings and the greyish forewings have undulating dark cross lines and a large ‘eye mark’. The ‘eye marks’ are a warning to predators, portraying the startling face of a much larger creature. 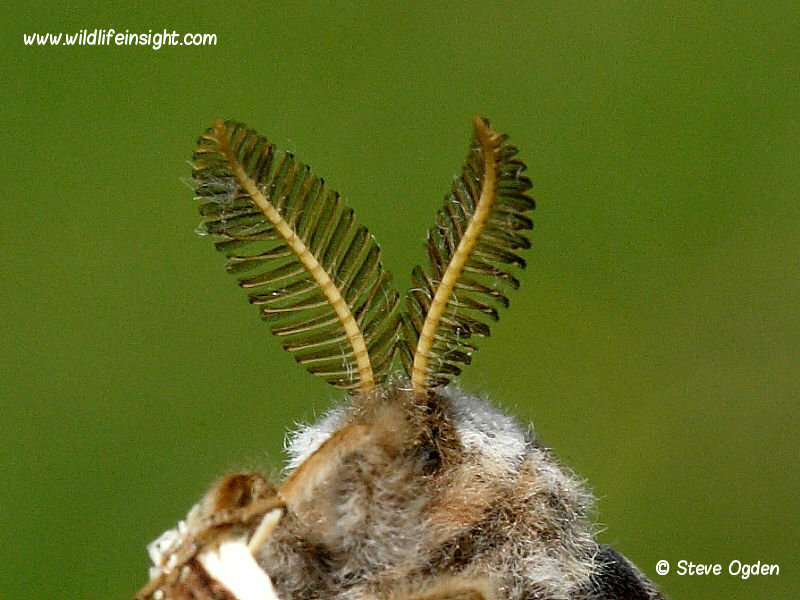 The male antennae are feathered and used to detect the pheromones given off by females. 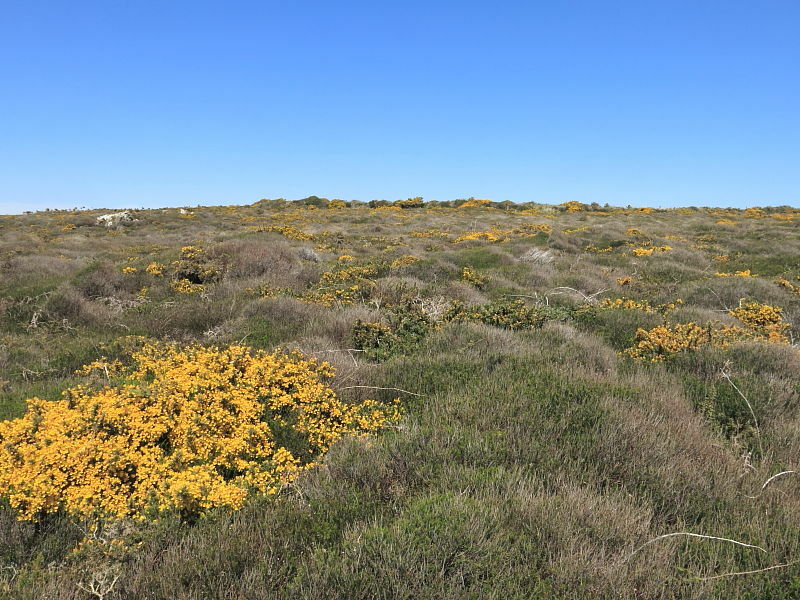 The male flies in fine weather during the day and may often be seen flying quickly over the tops of low growing vegetation following the scent trail of a recently emerged female. The larger female has a wing span of about 80mm and both hind and forewings are a mix of subtle shades of grey with undulating dark cross lines and a large ‘eye mark’. Her antennae are comparatively smooth edged compared to those of the males. She flies at night and is attracted to light in small numbers. 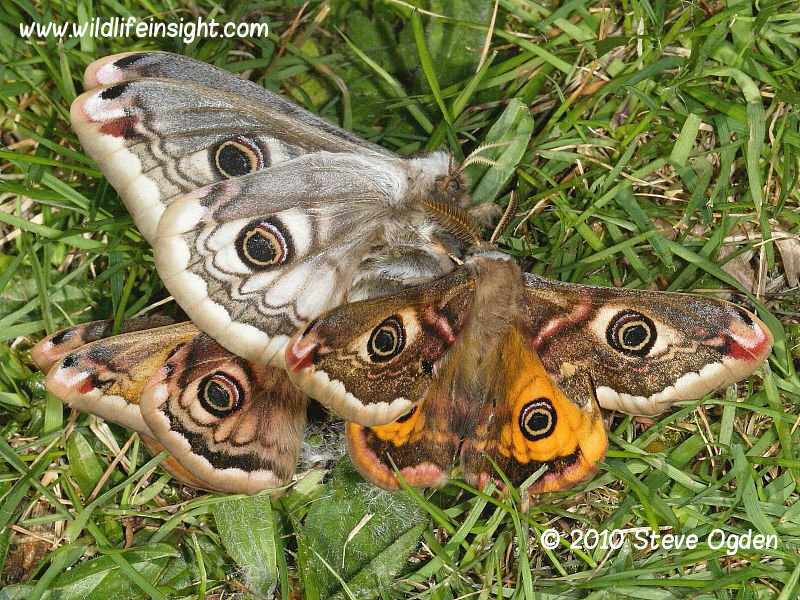 To attract males the female Emperor Moth gives off a potent scent trail of pheromones which is thought can lure males from over a mile away. The video shown below was one taken as part of a Cornish Primary School science project. Permission was granted for the Geneva Natural history museum to display the video for educational purposes in 2009. 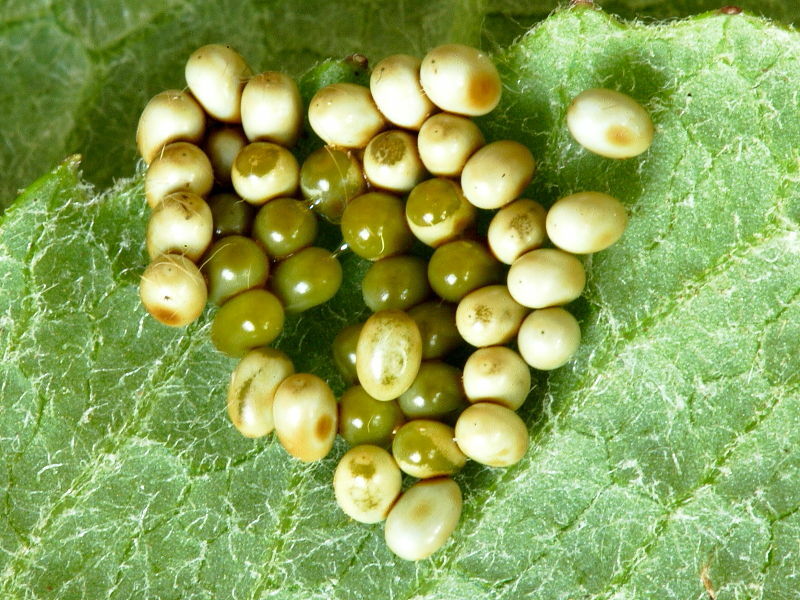 The batches of eggs laid on the foodplant normally hatch within ten days. 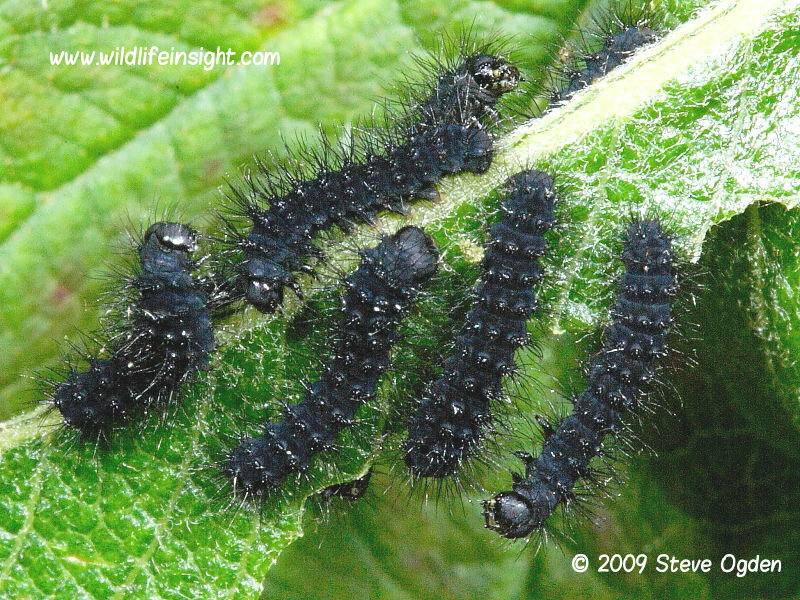 The caterpillars are black at first and grow quickly to a length of about 60mm feeding on a variety of trees and shrubs including Heather, Hawthorn, Blackthorn, Hazel, Sallow and Bramble. 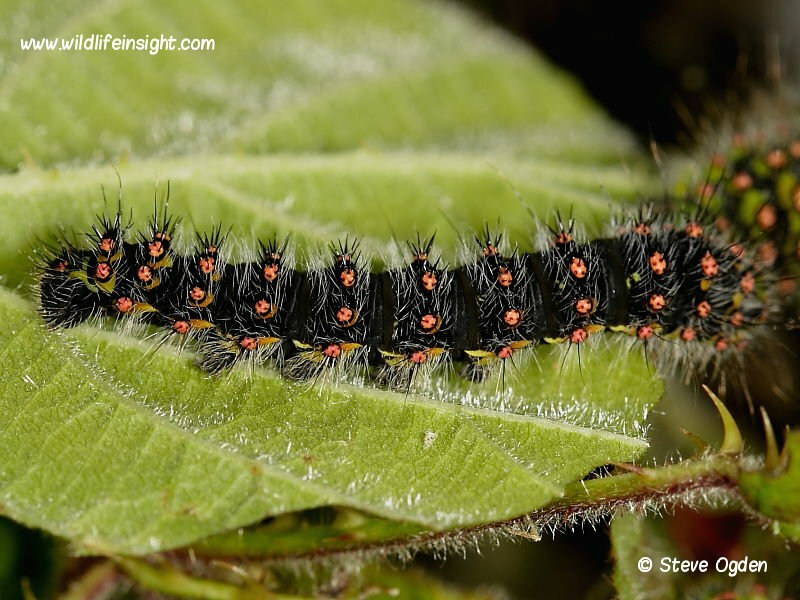 With each instar their colour changes, generally becoming progressively greener but variations occur with some very dark forms. Some of the colour variations are shown. 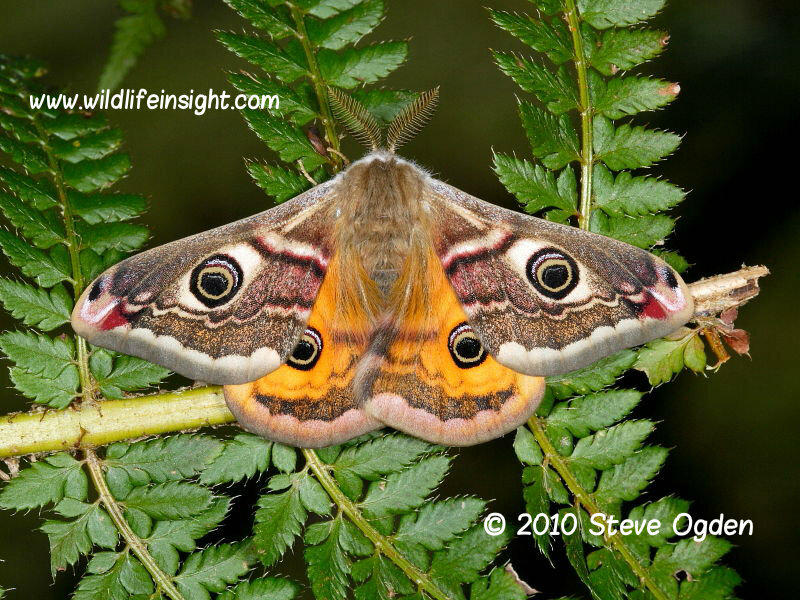 In common with most Saturniid caterpillars found worldwide the British Emperor moth has a small number of hairs that protrude from wort like projections. The bases of these hairs can be either white, yellow and even pink. 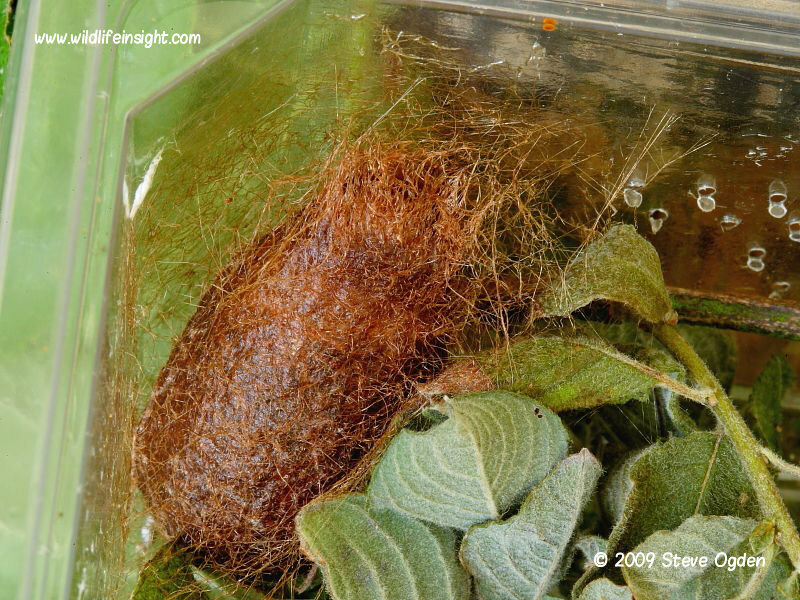 After about six weeks the fully grown caterpillars spin a ginger haired cocoon amongst the larval plant. The construction of the cocoon allows the emerging moth to exit while preventing parasitic insects from entering. The female’s cocoon is noticeably larger than that of the male’s. The pupae overwinter with the adult moths emerging between April and May. Rearing In common with the closely related tropical silkworms farmed for silk The Emperor Moth caterpillars are easy to rear. And consequently are commonly reared in schools as part of insect life cycle studies. Females are normally mated soon after emerging from their cocoons and those attracted to light readily lay eggs, sometimes even in containers without any food plant. 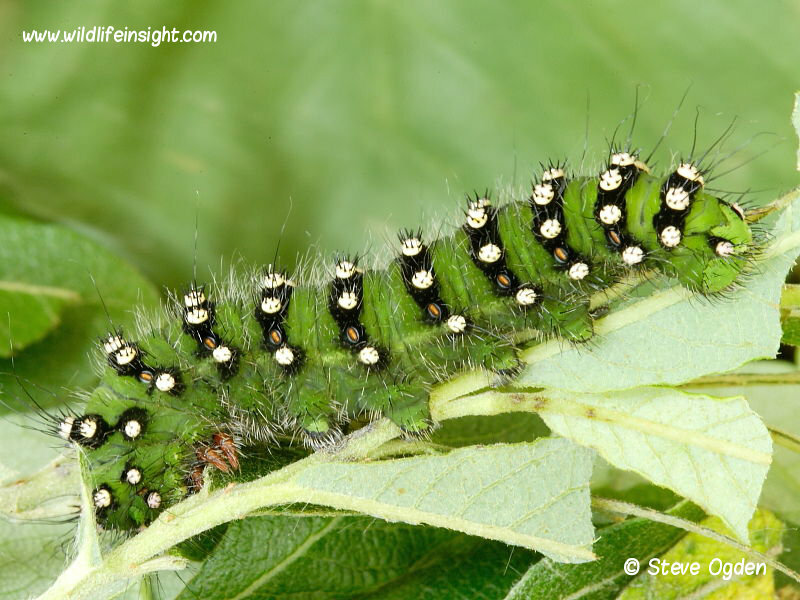 As well as heather the caterpillars can be reared on a variety of easily obtained foodplants including sallows, hawthorn, blackthorn, hazel and bramble. Rarely do Emperor moths visit light traps in numbers but an effective way to gauge a site’s population is to place an unmated, home reared female in a net. If conditions are suitable, sunny afternoons with light winds are best, this method will often quickly give a good indication if there are Emperors in the area. The speed with which males are able to respond to a female’s pheromones can be astonishing and it is not uncommon for more than one male to arrive at a time.